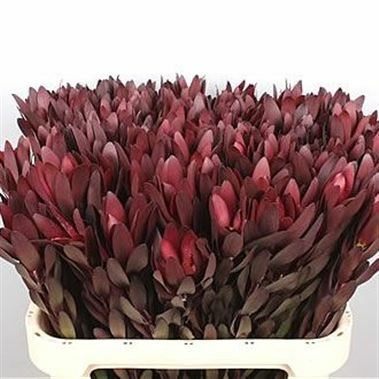 Leucadendron Safari Sunset is a Red cut flower. It is approx. 80cm and wholesaled in Batches of 50 stems. Leucadendron is a genus of the Proteaceae family and is native to South Africa. Leucadendron has a woody cone-shaped seed head at the very top and the waxy leaves are arranged in spirals along the length of the stem.